Although it’s been a hectic couple of weeks around here, and the month of October seems to be passing by at a startling pace, I’ve got another pattern up my sleeve that I haven’t gotten the chance to show off to you properly yet! 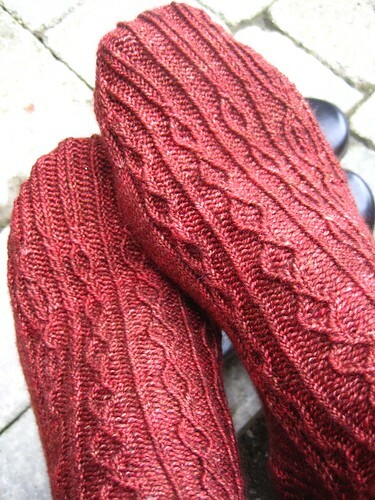 Allow me to present to the blog my Phellogen socks (available on Ravelry here, and on Patternfish here). I designed this pattern as a donation to the Tour de Sock (Ravelry link) knitting competition group, where participant fees are donated to charity and knitters get patterns along with the chance to finish quickly and compete for prizes. Sarah, the group organizer, asked me back in the summer if I’d like to contribute a pattern, and the only stipulation was “something with cables.” Heh. And since I do know my way around a cabled sock, and since I am a fan of charitable things, I went to my sock yarn stash and pulled out some yarn and got to work. When I was designing my Staked socks, I offered folks a modification to eliminate the swooshy angle across the foot, if desired, and simply continue the cables down the instep in a more classic fashion. I did this on a 3rd pair of my own Staked socks, and really liked how it looked – the result was a pair of matching but not identical socks, and the twisted cables feel so sleek and elegant once they’re on your feet. So, I decided to work with that general approach for this pair. On these socks, a slightly more prominent motif is featured at the outer edge of the leg and foot, combined with more modest, repeating twists towards the centre and inside of the foot. I left the heels and toes relatively plain, with twisted ribbing continuing out of the pattern motifs from the foot and leg. I like ’em. I used Madelinetosh Tosh Sock at a typical stockinette gauge of 8 sts/inch, but a variety of solid or semi-solid plied sock yarns would work nicely. Guys, I don’t think I had a full appreciation of what I was asking these competition knitters to do, by handing down this pattern to them. In my head I thought, “Hey, pretty cabled socks for fall! Fun times.” But the things is, in order for these folks to finish one round of the Tour de Sock before starting the next one, they need to finish a pair of socks in a week or less. Heh. Tour-de-Sock-ers, you are all AWESOME. Some of them finished these in less than two days. There are already almost 60 completed Ravelry projects for these socks, and many more WIPs, and they are all so impressive. I think it is one of those magical things where, given the pressure of a deadline, you don’t worry about whether or not you can do something, you just go ahead and do it. For regular sock knitters less inclined towards deadlines, though, the pattern is in wide release (see links at top of post), and you may feel free to knit it as quickly or slowly as you like. Happy knitting, and stay tuned to the end of the week when I just might have a blog giveaway for you. Have a great Wednesday! How is it the end of October already?! Nobody consulted me. Great sock pattern, as usual. Very pretty, I really like the pattern! Beautiful! And I can not believe how mean you are to give them a sock with all those cables and twisted stitches. But how worth it! 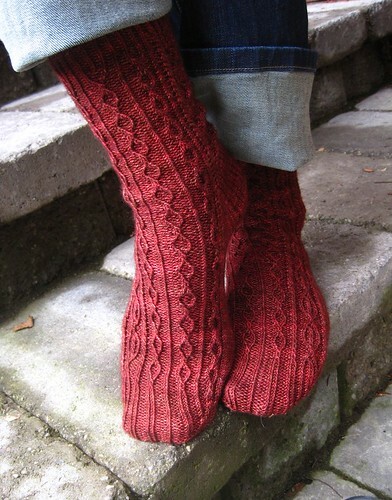 Liver Chick reblogged this on Liver Chick Knits and commented: Just had to share these socks with you. If I didn’t already have several sock designs in progress I would be casting these on. Having the pattern go all the way done to the toe is daring and gives the socks an uninterupted line that appears to go on forever. Great socks. I love the pattern. Read “American Gods” By Neil Gaiman. I couldn’t put it down. Awesome book! This pattern was just what I wanted for the Tour! Twisted stitches & Cables. Signature Glenna! Everyone loved it and it’s one of my favorites from the game!